Well, my intuition says one thing — the change in trajectory correlates very precisely with the end of the Bretton Woods system. My intuition says that that event was a seismic shift for wages, for gold, for oil, for trade. The data seems to support that — the end of the Bretton Woods system correlates beautifully to a rise in income inequality, a downward shift in total factor productivity, a huge upward swing in credit creation, the beginning of financialisation, the beginning of a new stage in globalisation, and a myriad of other things. Some, including Peter Thiel and James Hamilton, have suggested that there is data to suggest that an oil shock may have been the catalyst that put us into a new trajectory. 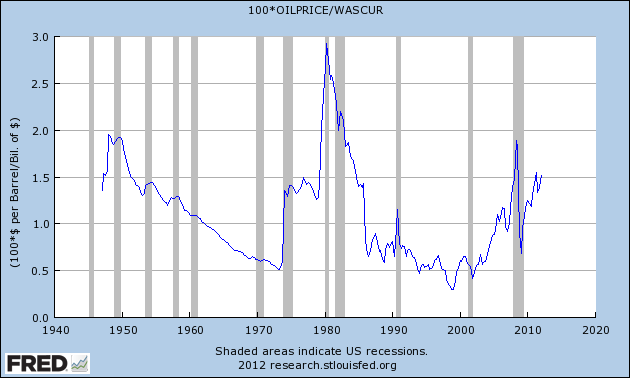 Oil prices in terms of US wages ended up lower than they had been before the oil shock. 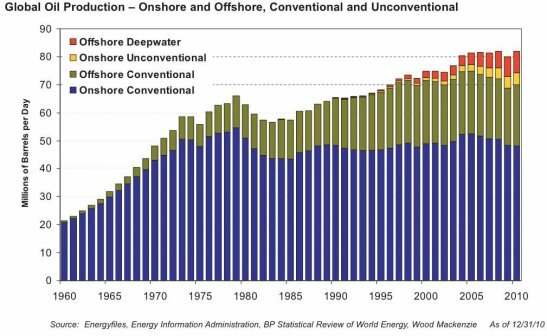 What happened in the late 70s and early 80s was a blip caused by the (very real) drop-off in American reserves, and the (in my view, psychological — considering that global proven oil reserves continue to rise to the present day) drop-off in global production. But while oil production recovered and prices fell, wages continued to stagnate. This suggests very strongly to me that the long-term issue was not an oil shock, but the fundamental change in the nature of the global trade system and the nature of money that took place in 1971 when Richard Nixon ended Bretton Woods. UPDATE: Commenters are pointing out that I should probably have concentrated a bit more on the trade and globalisation dimension, which I did mention in passing. However, I see this as an outgrowth of the end Bretton Woods, because it began just after Bretton Woods was ended and there is no way that America could afford to run the kind of trade balance it runs today with the world had America stayed in the Bretton Woods system. I have covered this issue in quite some depth in the past. This entry was posted in Current Affairs, Economics, Environment, Globalisation and tagged bretton woods, fiat money, global trade, gold, oil price, oil shock, peter thiel, productivity. Bookmark the permalink. It’s all about the money. Think 1913 and 1971 in the 20th century. Once you could balance international trade with counterfeit money, it was a done deal. And people worry way too much about oil and energy, too. Considering the fact that all matter IS energy, this does not seem to be an issue that should be weighing heavily on most people’s minds. Your article ignores the impact of international trade. In 1971, the US lifted a major trade embargo with China (See http://www.foreignaffairs.com/articles/24601/alexander-eckstein/chinas-trade-policy-and-sino-american-relations ). Int’l economics 101: Capital intensive countries, the U.S., will trade with labor intensive countries, China. Rents increase & wages decrease for the capital intensive country, the U.S..
I’m sure the change of the monetary system had an impact on U.S. domestic wages, but not nearly as powerful an impact as the U.S. opening their doors to cheap global labor supplies. Though I admit, I probably should have wrote a bit more about it. Rich folk get access to leverage 1st. Easing monetary policy chooses access to leverage over savings. Is this good or bad? What is the role of banks today? Do they capture the savings of a community and reinvest it into said community? Or, does saving the banks = saving the economy? Dude, tell me you’re not really 24 years old. You are way too wise for a 24-year-old. Added you to my blogroll. Actually I turned 25 in May, but keep forgetting to change my About page. 1st rule of Zombieland? Cardio! You’re absolutely right that fiat currencies contribute to trade imbalances. But what about another mechanism that inflation and easy money make capital investment more attractive than hiring? Here in the U.S. we’ve been seeing Rise of the Machines for some time. My intuition says that there must also be a component of steadily increasing population combined with increased use and effectiveness of automation during the period when those curves diverge. This is purely anecdotal, but I can report that I used to do corporate system analysis and computer programming. Basically, my job was to write software that would eliminate other people’s jobs while allowing the company to continue to do the same or more business with lower headcount. I was successful at my job and I am quite sure that I was not alone. 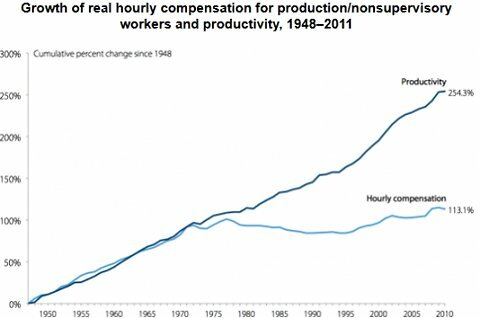 In my mind, the fruition of this approach to productivity must correspond to some degree with the period shown on the graph and must exert fairly substantial wage pressure. Technology does not displace human labor. It alters the dynamic and flow of labor. Where labor once was once needed in one geographical region to produce a certain product, it could shift to another geographical region or produce a new product. In the case of a computer and programming, the labor is transferred into “computer programming” and maintenance of the programs and machines. The production may be laid off employees in one certain region, but to produce such computers and machinery requires humans to mine the resources and produce the plastic, copper wiring, etc. So lowering headcount in one sector of the economy doesn’t mean the headcount is lowered in the total economy. Second point is the change in geographical flow of labor. When you eliminate a worker in a certain sector and create a new demand in a new sector, the system will search for the cheapest labor cost with the labor being equal. Since the experience of the old worker is no longer required, the competitive advantage of an american worker versus a chinese worker is 0. So unless barriers are placed so that employers would rather select the american worker, companies will time and again choose the chinese worker. So technological progress should not have had such a major effect on wage growth as compared to GDP growth. I think that I am reading you to say that if you displace human labor by automation that there is a necessary AND equivalent increase in demand for labor elsewhere. I’m either missing something or you are making an implicit assumption that there is no efficiency / productivity gain from replacing human labor with automated systems. I don’t know a lot of econotheory, but speaking from the point of view of a cog in the wheel, that assumption does not square with my experience. For sure computers must be manufactured, systems maintained, etc., but in the case that I mentioned above, there is no way that the labor that was eliminated by the work that I did was equivalently (either in number of jobs, or in payroll dollars) redistributed to somewhere else. The labor will flow into other avenues. Not necessarily your industry per se. It flows into entertainment, the arts, finance, bureaucracy, healthcare, Manufacturing Iphones, Ipads, semiconductors, transistors, etc. etc. Your one industry although large as it may be, is only a part of the much greater global economy. As I’ll say again, it is not simply replacing one same job with another same job. It could be in a totally different sector, but labor isn’t simply displaced. Same as with the development of agriculture. Farming displaced many individuals from the requirements of hunting and gathering. But they didn’t simply stop working or their labor output just vanish. It shifted to pottery, cloth working, dye making, etc. etc. So it is beyond just you and your industry. Technology does not eliminate labor, it shifts the labor output to other sectors and new sectors. BTW the jobs created by the computer revolution has dwarfed any jobs loss by your so called automation. Foxconn alone has over a million employees under payroll. Automation is a boogeyman. Robots aren’t taking american jobs. Poor peasants in China are. Wages are definately stagnating due to global trade liberalisation. The wealth is being equalised across the world. Eventually we’ll see wage parity and as Aziz mentioned in precious posts, the population and production will be concentrated in East Asia and India. machines can only do so much. provided populations increase you will see building related industries take most of the labour. Agriculture is already run by one farmer and a GPS guided tractor. Good times ahead. No work but cheap goods, so the welfare cheque will go so much further. If populations stagnate due to lower fertility, we can all move into the homes of the elderly. Then we’ll all be. Unemployed. Unless you work for the bureaucrat deparment! Well the alternate explanation of a change in the energy production system (i.e. an oil shock) doesn’t really fit. If you want me to really reconsider my view that the change in the trade framework and global monetary system was not the biggest factor, I need to see a viable alternative explanation. Could one not argue equally that the capital mobility requirements of globalisation forced an exit from the Bretton Woods framework? Chicken and egg. Globalisation really began out of the end of Bretton Woods. Staying in Bretton Woods in ’71 would meant a few painful years, and globalisation to the extent we see it today would have been impossible. It is impossible to say whether or not this would have been net + or -, however the overall trajectory of a vast array of data (I reference a few examples in the piece) has gotten worse since Bretton Woods ended. Well, excepting all the benefits of globalization of course, including a worldwide specialization of labor and capital. And it’s not really a chicken & egg, in that if globalisation caused the end of Bretton Woods, staying in Bretton Woods would not have stopped globalisation, it would have just caused a transfer of gold from the Treasury into the hands of cartels, and THEN Bretton Woods would have ended. Putting the genie back into the bottle comes to mind, as an analogy. A worldwide specialisation of capital and labour may well turn out to have been iatrogenic medicine, especially for the United States which has effectively been deindustrialised and made dependent on global resources, components and finished goods, and all associated trade routes. Into the hands of the cartels? The biggest cartel is the Federal Reserve, which currently has the gold you’re talking about. Do you mean that the gold would have ended up in the hand of America’s creditors? Surely that’s the fair thing? They acquired dollars on the basis that those dollars were redeemable in bullion, and then they find that the gold window is closed? That’s giving the finger to your creditors. I find it unbelievable that anyone has chosen to lend to the United States after that incident, and I find it wholly unsurprising that many of America’s creditors are now trying to dump the dollar as a reserve currency through enacting bilateral non-dollar-denominated trade agreements. The fallout from leaving Bretton Woods was delayed 40 years, but it seems now that the chickens are coming home to roost. So, had the USD made its creditors whole until they ran out of gold entirely, we’d be in a better position today (assuming for the moment that the monetary system WAS the cause rather than the effect) ? I don’t know, I’m not really sure I want to get into counterfactual history — this post is mainly about what happened in the real world, not whether there were better choices available at the time. It seems like it would have been a painful few years, but there were ways to restore confidence in the dollar without the Treasury running out of gold. And even if the Treasury had run out of gold, I imagine there were plenty of roads out of the hole — the USA was at the time the most productive, industrious and technologically advanced nation on the planet. 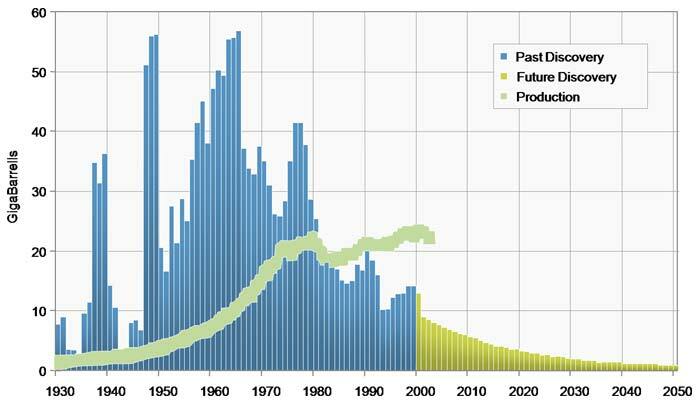 As Marx espoused, once the price of labor equalized through the world…game-over. It’s kind of hard to get your head around that sort of thing because globalism can not work for all kinds of reasons, paramount among them being the resistance of peoples everywhere to give up their national identity. But that doesn’t mean that the globalists will not take their lesson from this go-round and apply them more rigorously in the next cycle. It is the Holy Grail of The Elite. Eventually [with technology leading the way], the capitalist system will be supplanted by one that will solve the labor problem with higher efficiencies. Who knows what effects that nearly unlimited cheap energy/instantaneous transport, etc. will foist upon the world. Provided we have international football and the olympics, we will always have nationalism. I mean, Spains boost came from the win in the Football, not banking support. But the cheering fans were waving Chinese made flags. In the future globalisation through a common global culture will be spiced up with a PR campaign. Instead of being a German or a Englishman, you would BUY your identity through BRANDS! It is not too far away. I see the international flavour developing already. Chinese, Sudanese, Indian students are already adopting a global culture. Cosmopolitan Melbourne Australia is International already. The internet is glue in globalisation. As a result. Mises’ dream of free labour flows will become a reality, as Governments seek liberalisation of Visas to allow skilled staff to move to the next booming project. The regulatory capture of the immigration department and Minister or Congressmanby big business will happen globally. Australia is already experiencing this with big mining companies seeking permission to fly 6000 Mining experts to develop a new mine. Australian Engineers etc can not ask for the big money they have been used to. So not only do we have stagnationthe in blue collar wage growth, but there will be deflation in the wages of white collar and technical experts. Thank you for addressing Peak Oil. Helps understand a lot, doesn’t it? I wonder where you found the TOTAL DISCOVERIES, that’s hardly a type of data that’s openly accessible. Google. An intern on low pay accidentally posted it. Aziz, the deal is, who cares? If it runs out, no big deal. I think a case could be made that the split was due to the additional productivity of technology. The person was not actually becoming more skilled but just more efficient due to the technology. Whoever owns the technology/machine is not going to pay labor for the piece that their technology/machine is producing. Maybe going off the gold standard allowed additional investment in capital for some elites, which could have also been a factor in the split. Also, how is productivity judged? Did the worker create efficiencies? If not, does the worker deserve a piece? Any discussion of oil shocks as a cause of macroeconomic problems is completely wrong. Before 1971, oil was a commodity as shocking and exotic as eggplants. Its price barely changed at all; it was like a normal market where the price changes reflected real changes in supply and demand decisions. Even with the presence of oil cartels, enormous technological innovation in oil extraction, and large supply and demand shifts, prices solemn changed. 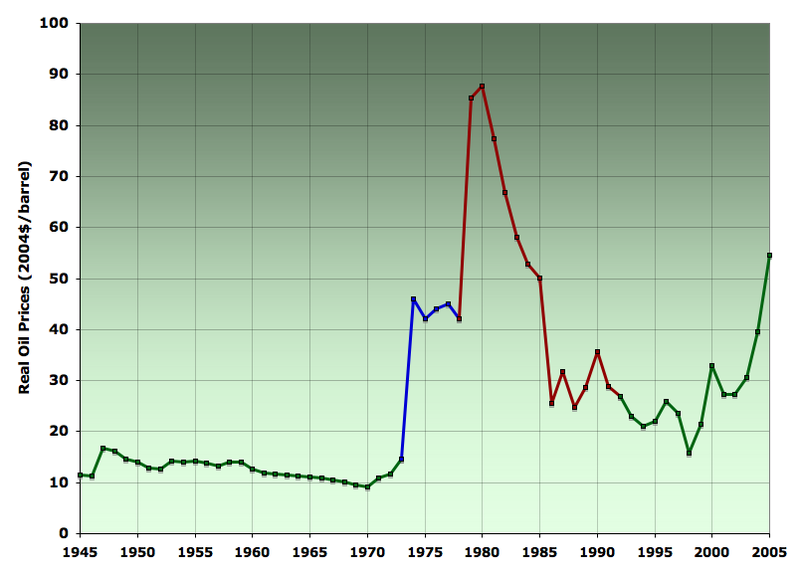 Then after 1971 and the tying of oil to the dollar, the price goes crazy. The large price run-ups coincide with large monetary expansionary phases, and the crashes in the price coincide with deflationary collapses. It’s so clear that monetary phenomena drive the changes in price of oil. To go back to your original point, you are absolutely correct. When monetary policy was set free from its last tenuous link to gold, it allowed the expansion of credit-dependent industries–firms that would fail if they had to get credit on the free market with everyone else, but survive because of ever-cheaper government-provided credit. These firms are, by the test of the market, unprofitable; they destroy resources. The result is that the US economy ‘grows’ in the meaningless manner of macro textbook metric-boosting, while the actual production of real goods and services that matter to human continues to deteriorate. So as a result, the average American works longer than ever, does not actually produce valuable goods, and witnesses a real deterioration in their quality of life. This is nowhere more pronounced than in food, whose quality continues to deteriorate, while its quantity grows in all its GDP-boosting grotesqueness. These firms are, by the test of the market, unprofitable; they destroy resources. The result is that the US economy ‘grows’ in the meaningless manner of macro textbook metric-boosting, while the actual production of real goods and services that matter to human continues to deteriorate. So as a result, the average American works longer than ever, does not actually produce valuable goods, and witnesses a real deterioration in their quality of life. GDP is a very ugly measure. The early 70s also marked the acceptance of dual incomes, with dual income lending officially mandated by the Equal Credit Opportunity Act of 1974. Looking at individuals, wages stagnated. Looking at couples, wages increased. This joint-income phenomenon is what supported and drove the housing bubble in large part. If your hypothesis is correct, then the same divergence at the same time should be shown consistently across the entire western world. Is it ?